Apples, Bananas, Oranges, Pears, Berries, and more: You’ve heard the saying before. An apple a day keeps the doctor away, right? There is actually something to it. 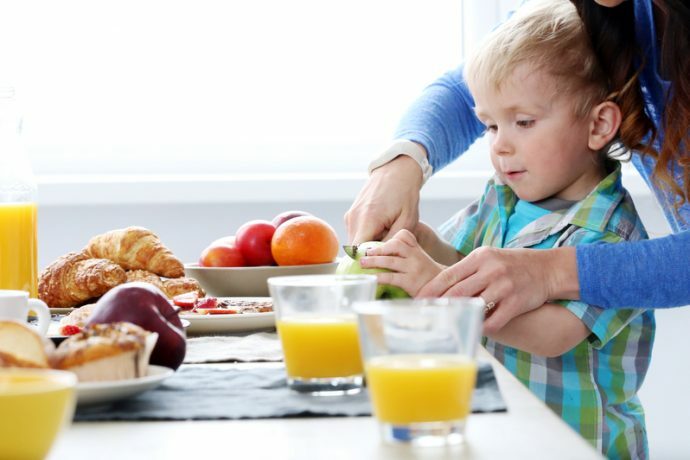 Having plenty of fruit for your kids to eat and take with them in the mornings is simply a great idea. It is not only simple but it’s also very healthy. When you think fruit you don’t typically think fiber, but it’s in there. Getting plenty of fiber will help to keep your body running smoothly throughout the day. Most medium size fruits like apples, pears, oranges, bananas and peaches have around 3-5 grams of fiber. That’s a pretty good start to getting the 25 grams per day that is recommended. Your AM fruit possibilities are endless: cut up all of your kids’ favorite fruits and make a fresh fruit salad. Berries, sliced up bananas and strawberries are a great addition to a bowl of cereal or oatmeal, and it just so happens that both taste great when topped with milk! Eggs: Eggs are a protein power pack and can be prepared in so many different ways. Throw some low-fat cheese on your scrambled eggs for a dose of calcium then wrap it all up in a tortilla to take on the road. Build your kids a amazing breakfast sandwich at home just by topping an English muffin with a poached egg, slice of ham, and slice of tomato (if you kids will allow it). Don’t forget to bring along your to-go containers of chocolate milk with re-sealable lids so you don’t have to worry about spills on the car ride to school! Chocolate Milk: The benefits of chocolate milk and chocolate milk drinks are clear, and that’s why it’s a favorite, it goes perfectly with most breakfast foods. Not only that, it provides an easy and tasty source of calcium and other vitamins your kids need. You can pair it with eggs and toast, or blend it up and make a nutritious smoothie; Chocolate milk makes your mornings a lot easier and your kids a lot happier. Low-fat yogurt: Yogurt, like chocolate milk, is one of the best nutritious foods for kids and a great source of calcium and provides your kids with nutrients they need to grow healthy and strong. When time is a luxury that you don’t have in the morning, yogurt can be your savior. Just top it with fruit and maybe some granola for a blast of carbohydrates and send your little ones on their way. Peanut butter: This super spread is packed with protein and heart-healthy fats. Not only does peanut butter add a little flavor but kids love it and it will add a little fun to your boring breakfast regulars. Spread some peanut butter on whole grain toast or a bagel and top it with banana slices or raisins. This is quick idea to go to if your clock is moving faster than your kids in the morning. The carbohydrate-protein combo will give them the energy their bodies need and the fruit will keep you happy and them healthy!